Words can not express just how excited I am about this latest big pot. I have broken all the rules and made it out of the wrong type of clay (there is not a speck of grog in the body) Grog for those uninitiated in the art of ceramic building is a grit/sand addition that gives the clay a better chance of not exploding and is better for fixings (and so no, grog in this case is not whisky, mores the pity). The moths are in various stages of take-off and I think that this is the frightening element and they are twice life size too. 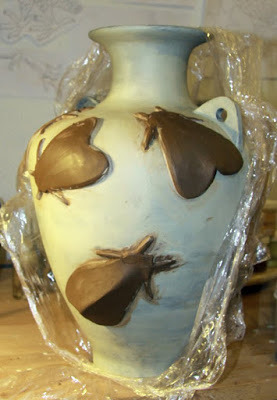 I am using clingfilm to handle the moths through and there is a lot of scoring and slip to fix, I hope they stay on. Maybe a bit more tomorrow if I get the chance to work on it. See earlier post for colour of the moths, the background however will be darker in every sense of the word.